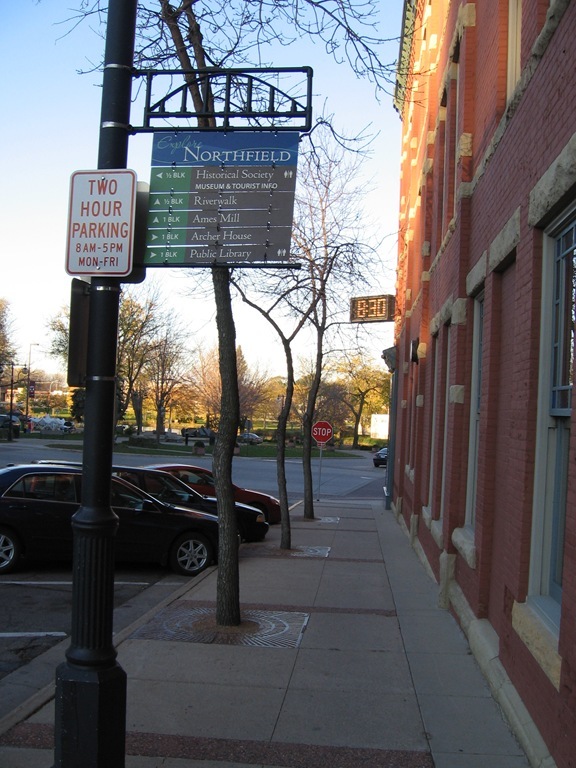 The new streetscape wayfinding sign is now up on 4th St. on the south side of the First National Bank Northfield. See Ross’ NDDC blog post for more details. 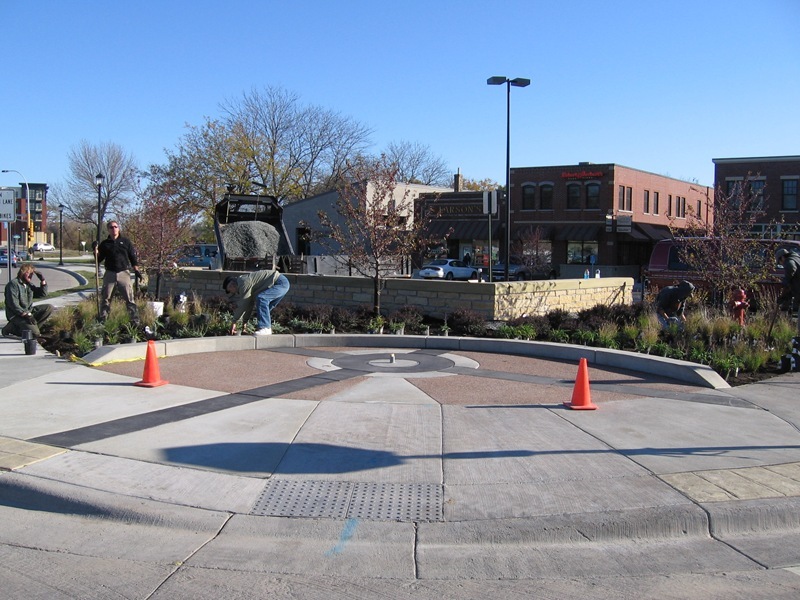 The new streetscape project at 3rd St. and Hwy 3 was mostly completed last Saturday. I took photos of Architect Spencer Jones there with a crew from Grove Landscaping as they finished up. All that’s left is the installation of a wayfinding sign. 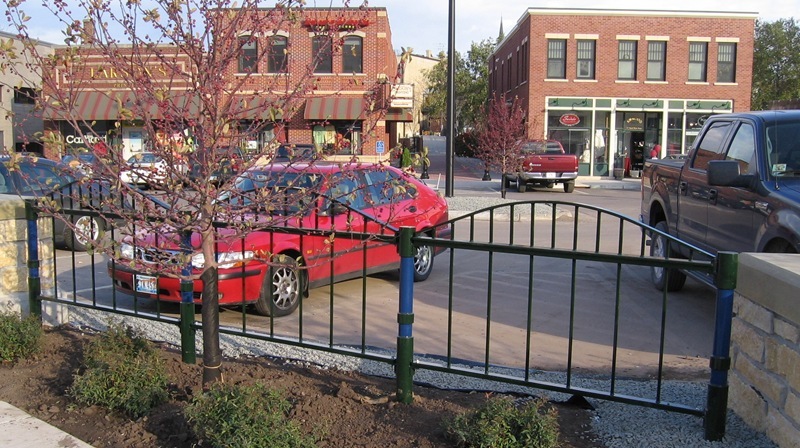 The arches on Division at 3rd St. were the initial streetscape installations. See the blog post, poll and discussion from Sept. 1. I have been watching the progress these last few weeks on the corner work at Mn Hwy 3 and the South Water parking lot. If you have not checked it out I would suggest doing so. The stone work on the walls is great, the bridge theme of the fencing is suttle and seems to work well. On the first day of the work they spaded out the only tree left after the hwy reconstruction project. I was dissappointed, but now I see they have planted several new trees. A fair trade by far. The old tree was pretty big but the new ones will be nice, unless you think size does matter. Also, the new walls take care of the need for a new skate board park, the kids should love it. and could barely read the wording, confessing that I don’t wear my walking glasses, cuz I only need them to read smallish writing. Well, I knew what the words on the sign said without actually seeing them clearly. I asked dh what he thought of the sign, and he said, “what sign?” while looking over in that general direction. Then he said he thought it was fine and that he could read it well. might not look up to see the rather dull small sign. I applaud the installation of the wayfinding sign. It will be a nice aid to visitors who want to walk around town. 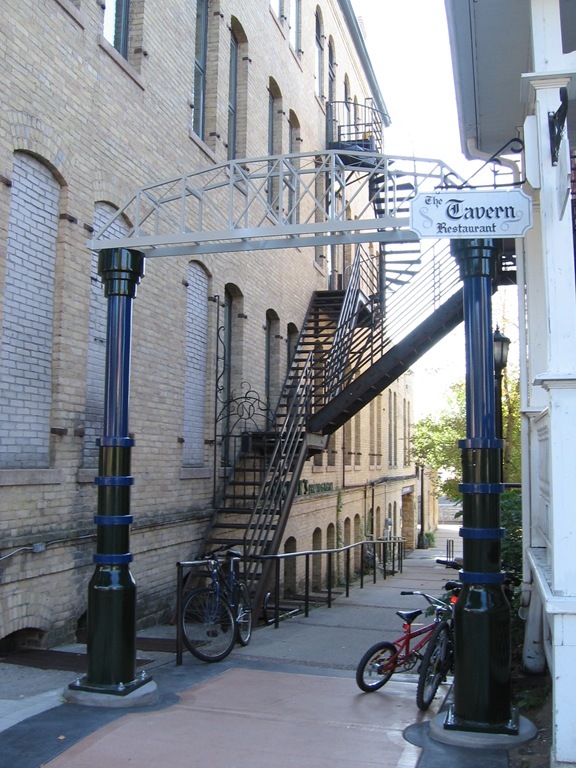 I begin to see the logic and the appeal… railings and the signs and the arches…same motif, same color scheme…eventually will create a unified aesthetic throughout the downtown. I like it and I look forward to further installations. The only unpleasant aspect of the picture of the sign is the prominence of the parking regulations sign right next to it…really detracts from the sign I think. What a pity. Can we find a way to get rid of these ugly aspects while introducing the more eye pleasing ones? Will motorists take all sorts of scabrous liberties if we don’t limit them to two hours? Do we really really need parking limits downtown? But if we do, need those signs be so prominent? Could they be on the buildings, maybe, so from the street they’d be visible (for the drivers) but not visible while walking down the street? 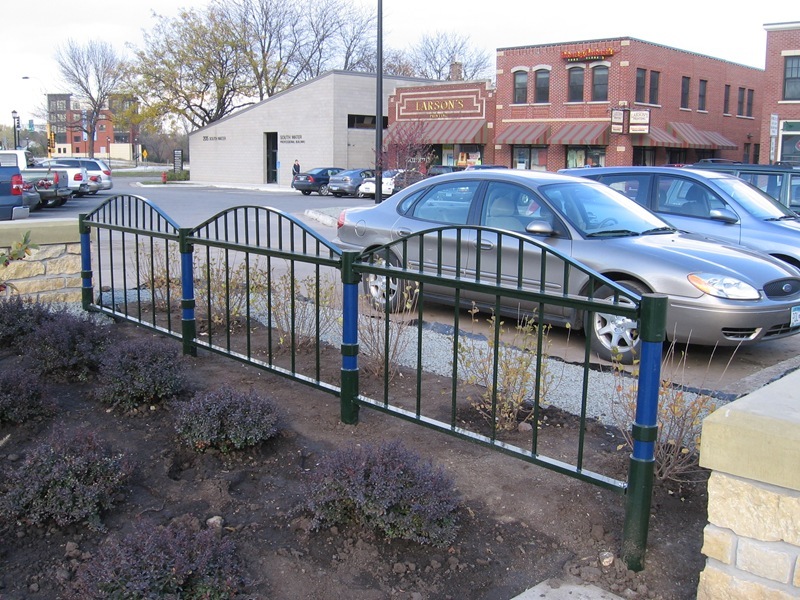 But…more my point…thanks to all those responsible for the streetscape improvements so far. As noted, sign now hanging is a prototype to evaluate whether or not the sign is the right size. (It was designed for the corner of 4th and Division, not mid-block, but this was the closet light pole.) 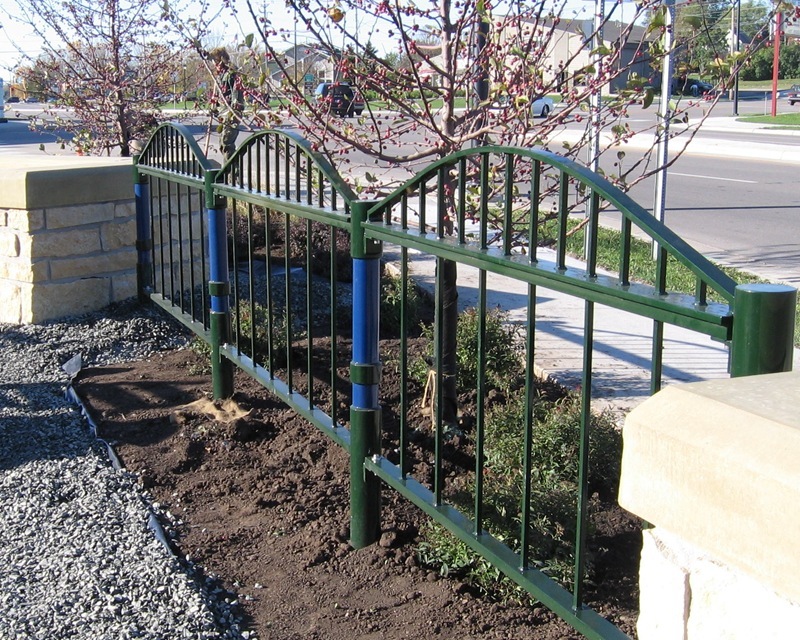 The final signs will be executed in wrought iron and metal panels. What looks good in a design, and even as a mock-up hanging indoors, now looks small when installed. We’re trying to balance the readability issues Bright describes in post #3, with not wanting to be too obtrusive in placing these wayfinding signs in the historic district. Visible to visitors, but after a short period of time, nearly invisible to residents. To further Philip’s comment, as the elements of the streetscape improvements roll out, I think we’ll all appreciate the thought that has gone into the various parts. 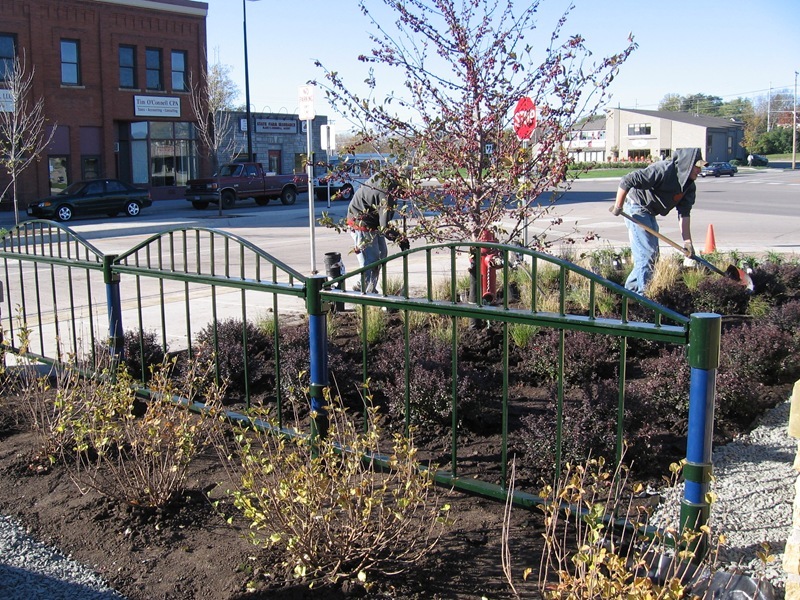 Over the past few years, the mayor, council members, city staff, volunteers on the Mayor’s Streetscape Task Force and various designers, planners and others have done a nice job integrating a few key motifs across the projects. 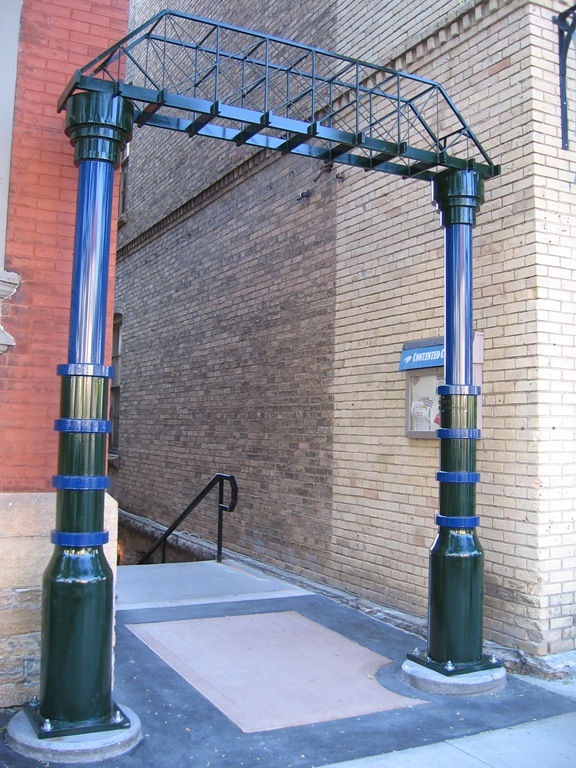 For example, the wrought iron bracket of the wayfinding signs is based on Spencer Jones’ designs for wrought iron fencing around city parking lots. In the end, a visitor to town might not notice every element, but the coherence of the designs, materials, colors and styles will communicate an aesthetic sensibility, a sense of purpose and a welcome that will reflect well on Northfield. inherent connection between the town and them, even though I remember a description given which ties in the river. I also have a slight objection to the more or less masculine nature of the work, with no feminine balance, unless you count the actual thru way as such. Randy, thanks for the update and explanation. Helps a lot. Is there or will there be a webpage where the whole streetscape project/rationale is explained in detail? I think it would especially help to have more info on the historical tie-ins to the old bridges with old photos. I’ve put up the 90-page final streetscape plan on the NDDC blog here, both in PDF and slideshow format. Yes, I charged NDDC for my time, but it was considerably less than $85,000. It would be neat to have a sign that talked about the history of the Cannon River originally being named the “Canoe River” somewhere near the landing. Maybe we could then consider it an investment in “human capital,” as it would be educational. my understanding from the presentation is that nothing is final at this point. The plans are there to bring feedback. The consultant did stress the desire to make the rive accessible via stairs. Griff, Is there any other way to view the final streetscape plan? In both the pdf and the slideshow options, the budget is too small to read. I would prefer not having to print it out to read it. Christine, you’re right, that Appendix H starting on p. 86 is very small print. But most PDFs, including this one, allow you to increase the magnification of any page. The budget pages start to become readable at 150%. Try that and let me know if how it goes. The signs could certainly be useful, but that prototype is pretty awful-looking. 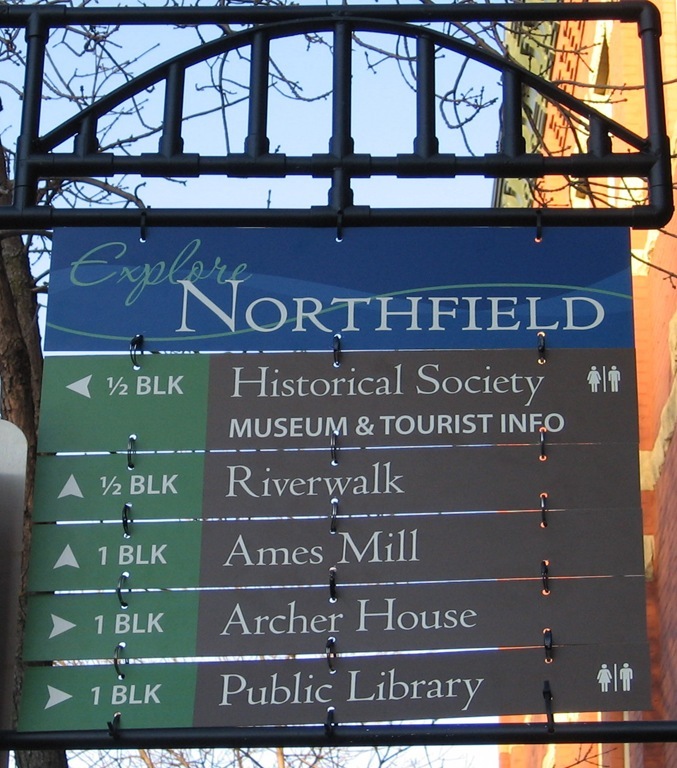 I don’t like the separation of brands between the City of Northfield and Explore Northfield™. I’d much prefer something utilitarian with the city’s logo or no logo at all. The most important issue with good wayfinding signs is visibility. They’ve gotta look good too, and reflect the story of the city. But because the most common disability involves vision, the ADA is specific about good visibility — size, contrast, type style, lighting… (ADA regulates indoor signage and parking but not trail or wayfinding as yet). – Reverse type. White type over color tests harder to read than dark type on light background. – Contrast. Not nearly enough between type and background. The background colors are nice but too soft. Again, visibility. – Serif fonts. Serifs are the lines on letters, as in this text here (comment titles are sans serif, or without). They chose a good serif font as far as that goes, but the different line thicknesses in most serifs increase reading difficulty — especially at speed, which is why most traffic signs use a sans serif font. – Arrows. They are not distinguished enough. From not so far, they will look like blobs to most people. I recommend arrows with angled heads and stems. – Frame. I haven’t studied Northfield history, but this framework symbolizes hardworking industrial and perhaps calls to mind a local bridge or other landmark – ? Anyway, very cool and enduringly hip, as long as industrial is the story of Northfield you want to tell. When I first saw it I thought Pittsburgh, any steelbelt town (no offense). And if they did actually make the frames out of pipe, double-cool because it’s sure to save money. – Icons. Good call using standard restroom icons. Everyone will be grateful for those at some point. I think this sign should go back to the drawing board, mainly to fix the numerous visibility issues. I would guess the designers may not have much experience with wayfinding signage and haven’t studied some important conventions, such as font style (Meta is great, highly readable), font size needs based on distance and rate of travel (dictating to some degree the size of the sign), etc. Do the squint test. Weak elements drop out and you can see the flaws that affect visibility. Notice how the Historical Society font is bigger but weaker than its subhead? Add poor vision of some visitors, poor lighting (overcast, twilight), too much distance or street speed, fading (consider HPL) and dirt/pollution, and you’ve got some things to overcome to make sure your wayfinding signs do their job for years to come.